Europe’s oldest luxury hotel group has branched out to create a presence across the Middle East, Africa, Asia and the Americas. Established in 1897, Kempinski’s portfolio has grown to more than 70 hotels in about 30 countries. Indonesia is on that list, with a hotel in Jakarta and — from next month — a five-star beachfront option on the Island of the Gods. The Apurva Kempinski Bali in Nusa Dua opens on February 1 and is described as a “majestic open-air theatre” and an embodiment of Indonesian elegance. It is being heralded as a new era of first-class hospitality. Apurva is Sanskrit for unique and magnificent. Award-winning architect Budiman Hendropurnomo, of Denton Corker Marshall, was inspired by Balinese tradition, way of life and art of balance. The Balinese believe that harmony is a combination of panca maha bhuta, or five elements consisting of akasa (ether), bayu (air), teja (fire), apah (water), and pertiwi (earth). “These five elements truly reflect the modern-Balinese architecture of the resort,” Kempinski explains. “The majestic grand staircase composition is inspired by Bali’s mother temple, Besakih. This signature architecture showcases 250 flight of stairs. There are 475 luxurious guest rooms, suites and villas ranging from 65sqm to more than 1370sqm. Of these, 176 suites and 43 villas have a private pool, while 48 grand deluxe rooms have direct access to a lagoon pool. An ocean suite at the Apurva Kempinski Bali. 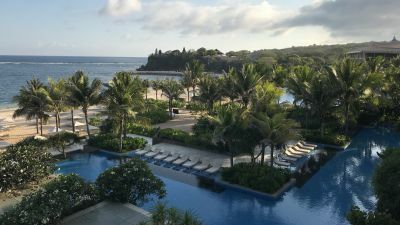 “The Apurva Kempinski Bali cascades down the hillside like one of Bali’s iconic rice paddies, emerging from the cliff tops and gradually making its way down to the Indian Ocean,” the hotel group says of the location. An Apurva Kempinski Bali suite bathroom. To celebrate the opening, The Apurva is offering 30 per cent off reservation rates. Prices for a grand deluxe room start from IDR3,190,286 ($314), which includes taxes and fees. Among the six dining venues is Bali’s first aquarium restaurant, Koral. Apurva Spa offers healing treatments based on the Javanese philosophy rupasampat wahyabiantara, where “true beauty is achieved when the outer beauty is in harmony with inner beauty”. Its treatments are based on the “four stages of life: teenage, adult, married and post-adult”. The easiest way to my heart is with delicious food. And chocolate. Mulia has given me both, so I am now head over heels for a resort. Waves crash in the distance as water trickles down giant statues surrounding me. Welcome to the Mulia, where stress starts to melt away the moment you're driven up the long and winding entrance to this east-coast resort in the more refined part of Bali, Nusa Dua.